Our Team - About Us - Barnes Lakeside Exterminating, Inc.
Barnes Lakeside Exterminating Company is a family owned and operated pest control business, serving Georgia since 1981. Fred Folsom, a veteran in the pest control industry with about four decades experience in pest control, termite control and fumigation, is the General Manager. His wife, Jackie, has overseen business operations for over 30 years. Their son, Jeffrey, is the Service Manager with two decades experience in pest control, termite control and fumigation. Their daughter, Jamie, has been assisting with business operations the last few years. 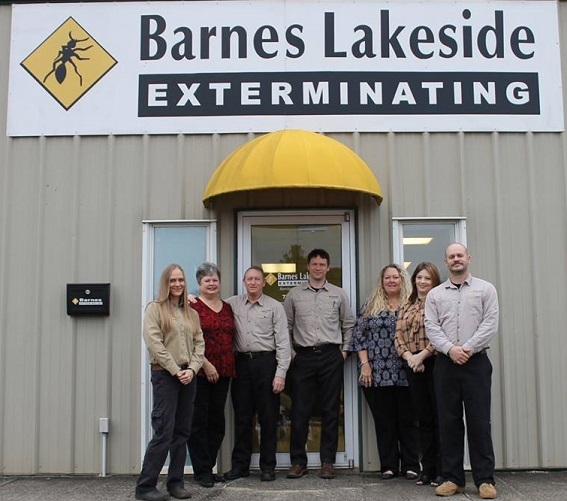 Barnes Lakeside Exterminating nurtures loyalty in our office and field staff; therefore, we have very little turnover. Our combined team of office staff and technicians has many decades of total experience in the pest control industry. Those years of training and experience have been invaluable in providing outstanding customer service. What does all of this mean? Simply this - when you call our office, you will hear the same friendly voices scheduling your service or fielding your questions. When you need service, you will see the same, familiar technicians at your home or business, giving you the most up-to-date, courteous, and safest pest control available. Your satisfaction is our priority. Contact Barnes Lakeside Exterminating today. Be a member of the Barnes Lakeside family!